In this lesson you have learned how to maintain details of bills specify credit periods and obtain receivable and payable reports. Businesses usually wish to maintain details of their creditors and debtors at the invoice level and, in Tally, this is called Bill-wise accounting. It is also called as Accounts Receivables and Accounts Payables, for Sundry Debtors and Sundry Creditors respectively. Set up Tally to use Bill-wise Details. The Bill-wise facility is turned on via the F11: Features button and setting Maintain bill wise details? To yes. At the Gateway of Tally, press F11: Company features. Type Yes for Bill-wise Details in Accounting Features. Accept the settings and Tally displays the Gateway of Tally. All the previously created customer and supplier accounts under the Groups Sundry Debtors and Sundry Creditors will automatically have Bill-wise details set to Yes. When you enter details of sales and purchases with Bill-wise turned on, Tally invites you to identify the invoice with an appropriate reference number. The reference can then be used to allocate payments to the correct invoice to maintain an accurate account of outstanding. of our debtors and creditors at the invoice level. “Default Credit Period” -> Credit period is the number of days allowed to the sundry debtor to pay back or assigned to our sundry creditor to remind us of our payables. Specifying the period here is automatically reflected in the transaction -> it can be altered if required. Let us make a purchase entry for a new stock item Anniyappa and then a sales entry to sell the same. We will purchase from a new supplier, Anniyappa and sell to a new customer First Independent Computers. Create a new stock item anniyappa, Stock Group Software, Stock Category – Not Applicable, Unit of measure nos, Std Cost 200 Price 300. Accept default for other parameters. From Gateway of Tally -> select Accounting Voucher -> F9: Purchase. Select As Voucher. Create the following entry. Date 11/12/07. Received invoice and goods – Invoice number PCG. Enter this in the Reference Field below Purchase voucher number. Bought 10 nos Anniyappa from Anniyappa Ltd at 220-on-site. No other expenses or charges. You already know how to enter up till this stage. When you Credit the Anniyappa Ltd, you must give the Bill-wise details. Select New Ref. The contents of Reference PCG – is copied and not the voucher number. Credit period – Give 15. This is 15 days from the effective date of the invoice. Accept the amount as the total amount due. At the Narration, type in your name. The Purchase Voucher will be displayed. Accept the voucher and then use the ‘Page Up” key and view the purchase voucher in alteration mode and click on the button F12: Configure. a. Expand into multiple lines. Accept the above configuration options and view the previous entry in alteration mode. Do you notice the new reference details you gave while making the entry? -> this is because we activated “ Show Bill-wise Details” in F12: Configure while we were on the voucher alteration screen of the purchase voucher. By setting the option “Show Inventory Details” – Tally shows the name of the stock item, quantity, rate and value details. These are provided so that you can see on screen what you are entering and if required you can also print the details if you configure as per your requirements in the printing configuration. Let us now check you bill-wise details for sale invoice entry! Select a party ledger account – for example, First Independent Computers – Tally immediately displays a screen showing details of dispatch details, address details, etc., -> this is because we have set “Accept Supplementary Details” to YES in F12: Configure.Carry out this simple experiment – set it to YES and see what happens. Then set it to NO and observe what happens. Create the following entry -> Date 12/12/-7. Sold 5 pcs Anniyappa to First Independent Computers at Rs. 250 from On-Site. No other expenses or charges. Allocate to Software Sales Account. After accepting the total amount, you are required to fill the bill-wise details. Select New Ref. In the sales invoice, the voucher number is copied as reference. Note the difference in behaviour from purchase entry. (In purchase entry the information given in the reference field is displayed in the bill-wise name field. In sales entry the voucher number is displayed in the bill-wise name field) In both cases, you can give any reference you want -> you can keep the invoice number or overwrite it. In this example, overwrite it with First Game. For Credit period -> notice that 7 days appears automatically (this is 7 days from the effective date of the invoice) -> 7 days credit period appears automatically as we have specified the same in the ledger master. Accept the amount as the total amount due. The bill-wise screen will be displayed. Accept the bill-wise allocation, and type in your name in the Narration field. On 13/12/07 bought and received goods from Anniyappa 5 nos Anniyappa at 200. Theirinvoice number 1234. Credit period 30 days. (Notice that the reference 1234 appears automatically as in the reference name in the bill-wise allocation). On 14/12/07 sold to First Independent Computers 4 nos Anniyappa at 245. Credit period 45 days, enter New reference as Second Game. Note: At the time of invoice entry, Tally will not allow you to alter the credit period. 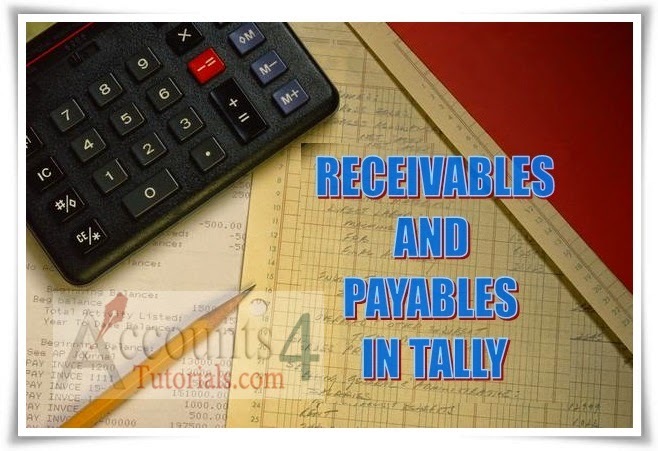 For this return to Gateway of Tally - > Accounting Vouchers -> F8: Sales (in invoice mode) -> click on F12: Configure and activate the option” Allow modification of ALL fields during entry” and then make the entry. If you wish Tally to restrict certain fields, you can configure. Whereas if you want the flexibility to alter all information, Tally can be configured to do that as well. SB & Company now has an additional Sundry Creditor – Anniyappa Ltd – which has two purchase invoices awaiting payment. It also has an additional Sundry Debtor – First Independent Computers – with two sales invoices for which payment ahs not been received. First you will see what the data looks like and then you will enter a payment and receipt. Select F4: Ledger and change to First Independent Computers to show the outstanding sales invoices. Select F1: Detailed to show the detail and then return to the Gateway of Tally main menu The outstanding report allows you to toggle between legers -> using the F4: Ledger button. If you wish, you can view the Age-wise outstanding- either by bill date or by due date. This is explained in the section – Displays Outstanding Statements. You can cross-verify in the following manner: Gateway of Tally -> Display -> Account Books -> Ledger -> select as required (Anniyapp Ltd) and you will view the Ledger details of Anniyappa Ltd. Change the data period as required and you will notice that there’s a button “Bill-wise”-> click on the same to view the outstanding report. On 20/12/07, you pay Anniyappa Ltd the full amount of their invoice number ANP. Click on the button F12: Configure and activate the option – “Show Table of Bills for selection” and accept the screen. This is to configure Tally to display a table listing out the pending bills references. Under particulars – select Anniyappa Ltd and enter 2200 as the amount. Note: When the original invoice details were entered. Tally asked for the invoice reference, which it placed in list of reference for this creditor. By selecting the Agst Ref. Option (against reference) Tally will new display the outstanding you saw earlier. Select Agst Ref and press enter – Tally displays a list of pending bills (this is because of the option we have activated in point 3). Select the first entry in the list – ANP – and keep pressing Enter until the next Particulars field is highlighted. Accept the entry and return to the Gateway of tally. To prove the payment has been recorded against the correct invoice, select Display,Statement of Accounts, Outstanding, Ledger and Anniyappa Ltd and you will see there is now only one entry. Return to the Gateway of Tally main menu. Delete the above entry -> on the payment voucher screen -> access F12: Configure and activate the option “Pre-allocate Bills for payment”. Make the above entry and notice the difference (the list of pending bills is displayed first before entering the amount). After experimenting, accept the entry and set the option “Pre-allocate Bills for payment” to NO. Gateway of Tally -> Accounting Vouchers -> F6: Receipt -> F12: configure and set the option Use Single Entry mode for Pymt/Rcpt/Contra” to No” -> accept the configuration screen. On the voucher creation screen – at the credit field -> Enter First Independent Computers and the amount of 1250. In the Bill-wise details screen – select Agst Ref. If you are adjusting the receipt against a particular invoice for which a reference was given earlier. In this example, select the first entry in the list. Keep pressing Enter until the next Particulars field is highlighted. Enter bank Account, confirm the amount, Accept and return to the Gateway of Tally main menu. To prove the receipt has been recorded against the correct invoice select Display, Statements of accounts, Outstanding, Ledger and First Independent Computers and you will see there is now only one entry. Tally retains the history of settled invoice. Press F12: Configure and tab down to Range of Bills to Show and select All Bills -> Select Detailed. Experiment with the different options and then return to the Gateway of Tally main menu. Select Display, Statements of Accounts and then Outstanding. Select Ledger. Select Anniyappa Ltd. The invoice due to them is displayed with due dates and overdue days if any. Note the age of the invoices segregated by period. Press Alt+F1 and view the Age-wise Analysis for Anniyappa Ltd in Detailed mode -> click on F12: Configure and set the option ‘Show Qty Info in Detailed Format’ to YES. Change the display period from 1-4-07 to 19-12-07. Observe the change. See the Age-wise Analysis for receivables. Do likewise for payables ad then for a Ledger. Return to Gateway of Tally. You have already noticed this option in the bill-wise sub-screen at the time of entering voucher. Advance is for payments or receipts that are made in advance against which you will adjust the purchase or sales bill later. Typically, when a bill is raised where advance exists, part of the bill will be adjusted against the advance (using Agst Ref) and the rest carried as New Ref. Now, return the Gateway of Tally and shu8t Anniyappa Ltd and Select My Company. Please create this example in My Company and NOT Anniyappa Ltd. Create a ledger “New Supplier” and make a bank payment (State Bank of India Account) on 1-12-07 of Rs. 15000 against a purchase order PO/001/2006-07 raised on a supplier. In the bill wise details select Advance as type of reference and in the name of the reference, give the PO reference. Then make a purchase voucher entry on 1/12/2007 for Rs. 35000/- and at the bill-wise details screen – select against reference because we have to adjust against the advance of Rs. 15000/- -> accept the purchase entry. At this point, it is understood that you know how to create the payment and purchase entries. The “advance” tag appears next to the entry – this is for easy identification. Note that you can print statements of account by simple pressing the Print button during Display. You can also print reminder letters for customers when displaying their individual outstanding ledger. For multiple statements and reminder letters the Multi-Account Printing option I the main menu Gateway of Tally has several options. By default, Tally would maintain ledger wise balance and display net debit or credit balance for a ledger. If we receive or grant credit on purchases or sales, mere ledger balance may not reflect the true state of affairs – as a ledger may show an amount due which may not be overdue on that date. By maintaining Bill wise details, we can get bill wise outstanding, compute bill wise overdue interest.